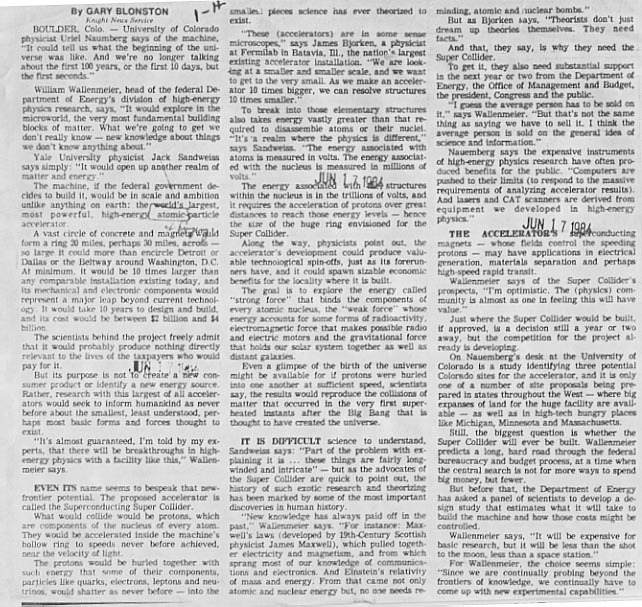 While an undergraduate student majoring in geology I had to take several physics courses. 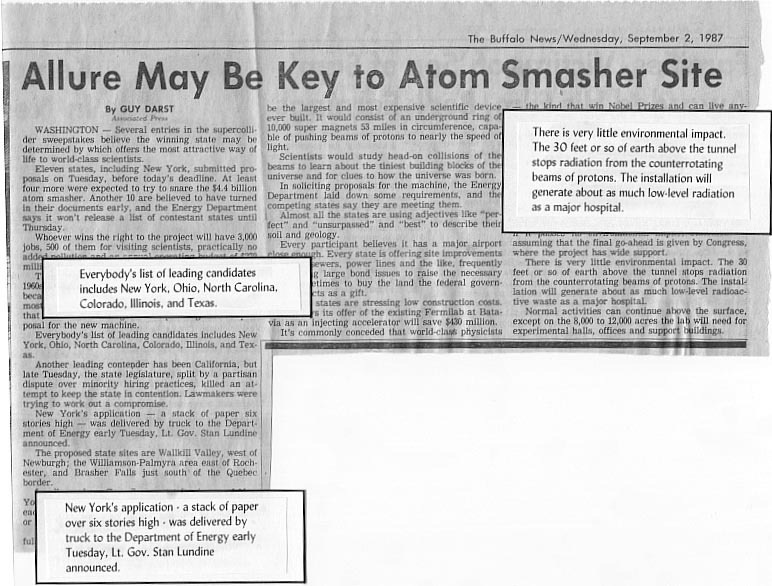 One Sunday morning (June 17th, 1984) there appeared a syndicated article in the Buffalo newspaper by Gary Blonston, about a proposal to construct a massive particle physics collider. 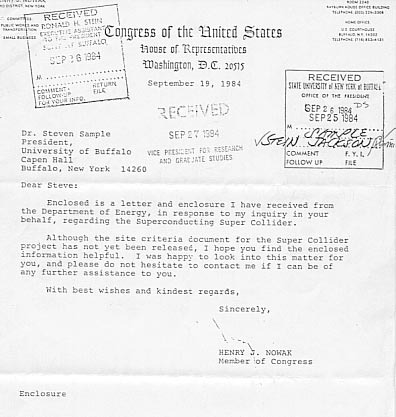 Motivated to improve our community, I approached my physics professor - he scoffed at the idea of the Superconducting Super Collider being located near Buffalo. I spoke with the head of the the University of Buffalo research office who also said it was too big a project for Buffalo. 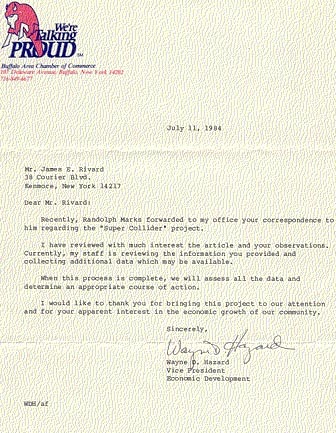 Undaunted, I then drafted a letter and distributed it to the political and business and university officials who would be the movers and shakers to make the idea a reality. I also sent a copy to the Canadian Dept. of Energy, Research and Technology Center, in Ottowa. 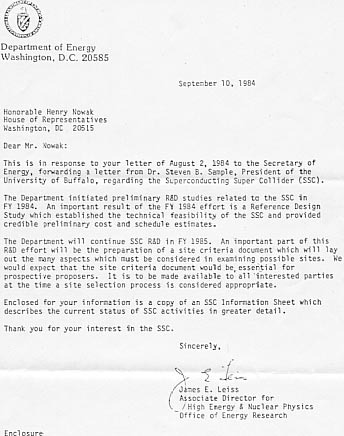 The PROPOSAL to locate the SSC near Buffalo became a reality. Buffalo almost won the bid. All the States in the Northeast endorsed the New York bid. Washington decided to award the bid to Texas because Vice-president Bush was from Texas, and Jim Wright, the Speaker of the House of Representatives was from Texas. After a brief start, with the budget deficit soaring, the project was canceled as too expensive. A good overview of the SSC. Pictures of the SSC tunneling project. Somewant to try for another SSC. Some think the money would be a wise investment. The U.S. Secretary of Energy agrees that we need an international approach.